A real sports car is more than the sum of its parts. The same is true for this tremendously authentic-looking version made of plastic. It’s more than a model. It’s a work of art–and a fascinating experience. It’s not easy to impress Frank-Steffen Walliser, a mechanical engineer and the head of Porsche Motorsport and GT vehicles. He keeps pressing the shift paddles. The dual-clutch transmission goes into action, and the gears click in. 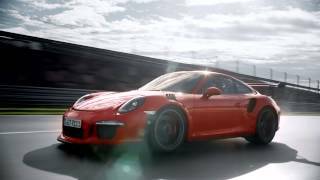 An entirely normal course of events in a Porsche 911 GT3 RS. But this Lava Orange model is not parked in front of the building outside. It’s standing on his desk, and it’s from Lego. As a child, Walliser made cars from sets of plastic bricks from the Danish company–such as the car with article number 8860. It had 662 components, a boxer engine, differential, rear-wheel suspension, and precision steering. “That model did a lot to fuel my interest in cars, which later led me to study engineering and work in the field.” But this one here? Incredible! Uwe Wabra, a senior designer in the Lego Technic Team, has brought along an 8860 model from 1980; in comparison, the GT3 RS looks like it comes from another world. Wabra and his team spent about two years developing it. It has 2,704 parts, of which fewer than 10 percent are new. The rest are all previously existing Lego Technic elements. The rims, of course, are new. Porsche only! These black works of art are available only as part of this set–along with a plaque that has a laser-engraved serial number. As unique as a fingerprint, it is a piece that you save for the very end. Click. It’s in. It’s finished. The moment of joy is finally here, with part number 2,704 now in place. “The Porsche 911 GT3 RS is an absolute highlight in our Lego Technic series,” says Wabra. “The entire development phase was top secret. And the concept itself is exceptional: we weren’t just interested in the finished model, but also in the experience of assembling it.” Even the packaging is special: for the first time, the elements of the individual assembly groups are packed in separate boxes. Together with the comprehensive construction manual, they give insight into the assembly process of the original. Even the stages of construction are similar to those of the real thing, including the “marriage,” when the engine and transmission are joined in the chassis. Likewise, the presentation of the model to the public in the spring of 2016 was similar to the unveiling of a real Porsche. It was kept under wraps during the lead-up to the big toy fairs in London and Nuremberg. The fans on the exhibition floors went crazy. Many tried to secure a set in advance–or better still, two. One to build and another to keep sealed in the original packaging as an investment. Since August, Lego Technic model number 42056 has been available worldwide. A minimum age of sixteen is recommended. There’s no mention of an upper age limit, though, because the younger folks will clearly not be the only ones poring over those 2,704 plastic parts. There are 57 centimeters of high technology waiting to be assembled. Build the legendary 911 GT3 RS yourself from more than 2,700 parts. Porsche has been working with PLAYMOBIL and LEGO to develop playsets.